Recently, several of us here at Esri had the opportunity to attend and support FOSS4G, the ‘Free and Open Source Software for GIS’ conference, this year held in Denver, Colorado.Esri was sponsoring large, and with four speaking slots and a fully staffed booth, I’d like to think we were valuable contributors to this event—which seemed to be a terrific success, with over 900 attendees. 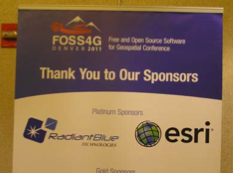 Esri was a platinum sponsor of FOSS4G 2011. Photo courtesy Joseph Kerski. When I became interested in open source and GIS at Esri, the geospatial community had an “Us v. Them” mentality and, at the time, it also existed in the non-geo open source arena with Microsoft taking a hit. But over the past six or seven years, there has been a noticeable shift—a transformation in the IT industry resulting in a hybridization of technology portfolios, leveraging both open- and closed-source. In my observation, until recently, this trend towards a mixed source environment has been slower to be adopted in the geospatial community. The largest glimmer of this shift happening was evidenced while at FOSS4G, with a majority of the attendees new to geospatial open source and unfamiliar with any of the historical baggage that some of us, like myself, have observed.Indeed, I have seen this move to the middle—leveraging both open and closed-source—within Esri as well:In the past few years, Esri has released several open source projects hosted on SourceForge, CodePlex, and Github, as well as contributions to the GDAL project; and it’s hard to overlook the nearly 100 different open source APIs, libraries, and projects that the core ArcGIS system now consumes. 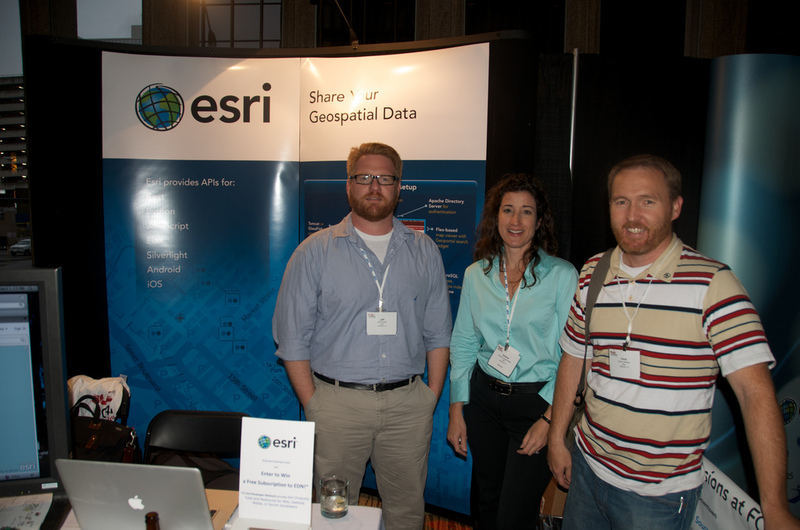 Esri staff (L-to-R): Jeff Archer, Victoria Kouyoumjian, and Chris Lesueur, at FOSS4G 2011. Photo courtesy: Peter Batty. But time and again, many of us representing Esri at FOSS4G were asked directly, “What are YOU doing here?” Most were polite. My response to this question—to geo developers and users, consultants and start-ups, SMBs and large traditional organizations, both closed and open alike:We’re All In This Together.If you want to further the cause and broaden the application of GIS, it’s time to bridge the gap that apparently still exists in the geospatial community between open- and closed-source, transcending the bad game of Tug o’ war that has been going on between and within these GIS partitions. 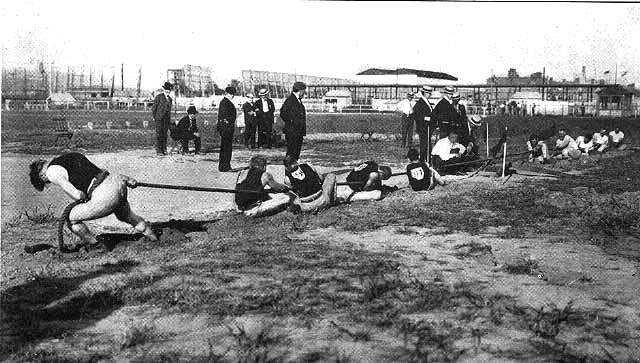 The interesting thing about Tug o’war is that, unless the rope breaks under duress, both sides succeed in exhaustion in the end. I would posit that the schism that has divided the open- and closed-source GIS communities must be bridged if we (collectively) are to succeed with a universal objective: To witness GIS as ubiquitous, enabling better business and government and neighborhoods.And imagine no longer taking three minutes to explain “GIS” to the unacquainted! (Frankly, I now find myself describing it as “geospatial analytics and intelligent mapping”, to those unfamiliar. )If we lack a unified front in this regard, it can only weaken this objective.Acrimony can be infectious, spreading like a virus, serving only to break down the community continuity and unravel all of the positive work and forward strides you all have made.It should not be a choice of “closed” or “open” taken in isolation—it’s based on the best business model for you and your organization, and the most appropriate tool that provides Fitness of Purpose, in order to ensure the greatest success for those consuming it, shining a bright light on the solution, the innovator, and the remarkable technology that enabled it to happen.